Stephen Williamson: New Monetarist Economics: Is Bitcoin a Waste of Resources? If nothing else, Bitcoin gives us something to talk about. My non-monetary-theorist colleagues want to talk about it; my students want to talk about it; it's a surefire conversation-starter with strangers; it's a distraction from Donald Trump. But, should a sensible person buy the stuff? Should society tolerate it? First, let's review what Bitcoin is. The open-source software for Bitcoin was introduced in 2009, and it represents a decentralized means for transferring ownership of digital objects, along with a decentralized system for augmenting the supply of such objects. Central to how Bitcoin works is the blockchain, which consists of a record of the entire history of ownership of the digitial objects - the "coins." The ingenious part of the system (and the hardest part to understand) is how the blockchain is updated. David Andolfatto gives a nice explanation of how the thing works. Also see this paper by Berentsen and Schar. No one owns the blockchain, but it is distributed among the community of users - it's a "distributed ledger." "Miners" (which is really not an apt description of what these people do) compete to form the next block in the chain - basically their job is the counterpart of what happens in the clearing and settlement process in a centralized monetary system, such as interbank payments. For the system to work, it has to be more costly to cheat than for the correct information to be added in the new block. Thus, the system adjusts the costs of mining over time to keep up with technology. If the costs are too low, then cheating might occur - it's important to slow the clearing and settlement process down sufficiently, and the designers of the system shoot for a time lag of 10 minutes from when a transaction is posted to when it goes into the blockchain. The mining process is costly. Being a miner requires a lot of computing capacity, and one needs to burn much electricity in order to have a chance of winning the payment you receive for successfully verifying a transaction. Harnessing more computing power, finding cheap sources of electricity, and inventing faster chips (tailor-made for this purpose) implies a higher probability of a payoff, if you want to mine. What role could Bitcoin - and other competitors such as Ethereum - play in the economy? What good could these systems do for society as a whole? The idea seems to be that such systems could provide us with an efficient means for carrying out transactions. In principle, centralized transactions - routed through the banking system and central banks - seem costly. There are large numbers of people working in these financial institutions, they occupy a lot of real estate, they require a lot of equipment and software, and they burn electricity. But, these systems work. They handle huge volumes of transactions every day, provide protection against fraud, and provide recourse when things go bad - like when the object you bought with your Visa card turns out to be something you weren't expecting. Further, we already have a decentralized means for executing transactions - paper currency. While currency doesn't permit some of the kinds of transactions we might like to make in modern societies - you can't buy stuff from Amazon with it - it is remarkably cost-effective. Proof of ownership is just a matter of physical possession, and transfer of ownership is essentially costless. I show the Starbucks cashier my cash, and hand it over. Of course, there's a centralized system in place that maintains the currency stock, assures that counterfeiting is a high-cost activity, and stabilizes the value of currency in terms of goods and services. That's called a central bank. The chart shows two prices. The blue line is the price of gold in dollars, while the red line is the price of US currency in terms of goods and services, measured by the inverse of the PCE deflator. The smoothness in the red line is no accident of course. That's the outcome of many person-hours of research, analysis, and meeting time in the Fed, all aimed at managing money and payments in such a way that the value of money in terms of goods and services is predictable. Clearly the price of gold in terms of money, and by implication the price of gold in terms of goods and services, is not very predictable. That's why no one wants to use gold to make payments - the alternatives are so much better. It has been well-understood for a long time that, in order for money to have a predictable value in terms of goods and services, its supply has to be "elastic." The demand for means of payment fluctuates from day to day, week to week, and month to month. Why? (i) Aggregate economic activity fluctuates (even within the week - there are more people in the shopping mall on Saturday than on Monday); (ii) Wholesale payment activity can fluctuate considerably due to variation in financial market activity, and large one-time interbank transactions, for example. So, if demand is fluctuating, and we want price stability, supply needs to fluctuate in tandem with demand. Elasticity also makes the whole financial system work more efficiently. For example, the framers of the Federal Reserve Act understood that inelastic money in the post-civil war era in the US helped to create banking panics and financial instability. That is, Bitcoin is worth about five times what it was in the middle of last year, but about half of what it was last month. This makes gold look stable. There's been a lot of talk about whether or not this represents a "bubble." Whenever someone talks to me about bubbles, I ask them to define it. The answer they give typically puts them into three camps: (i) irrational bubble people; (ii) rational bubble people; (iii) people who haven't the foggiest idea which end is up. Robert Shiller is probably the best-known irrational bubble person. He's written books like this one, coauthored with George Akerlof. An irrational bubble is supported by irrational behavior on the part of at least some market participants. For example, suppose there is an asset that will, with certainty, be valueless at some future date. But, people bid up the price of the asset, in the belief that there are some stupid people in the market who they can sell to before the price crashes. Sure enough, some stupid people enter the market, and they end up holding the bag when the price goes to zero, according to the irrational bubble folks. Shiller doesn't quite know what to make of Bitcoin. As far as he's concerned it could be gone tomorrow, or in a hundred years. But he seems to think it's a bubble, which isn't saying much, as Shiller sees irrational bubbles in essentially all asset markets. Rational bubbles are all too familiar to any monetary theorist. A rational bubble occurs when an asset's value exceeds the present value of the expected future payoffs on the asset, appropriately discounted. To evaluate whether a rational bubble exists requires a model - in part to tell us what "appropriately discounted" means. Fiat money is a bubble, as it has no explicit future payoffs, yet people value it in exchange. There are other types of rational bubbles, for example the currently-observed low real interest rate on government debt can be considered a bubble phenomenon. Government debt is used in exchange, and as collateral in financial markets, so that its price exceeds the present value of its future payoffs - high prices imply low interest rates. Is Bitcoin an irrational bubble? How would we tell? In some sense, going the irrational bubble route is a copout - we're abandoning any attempt to put structure on what is going on so we can understand it. Clearly the irrational bubble approach isn't helping Shiller - he can't tell us when the collapse will come. Could be tomorrow. Could be in 100 years. 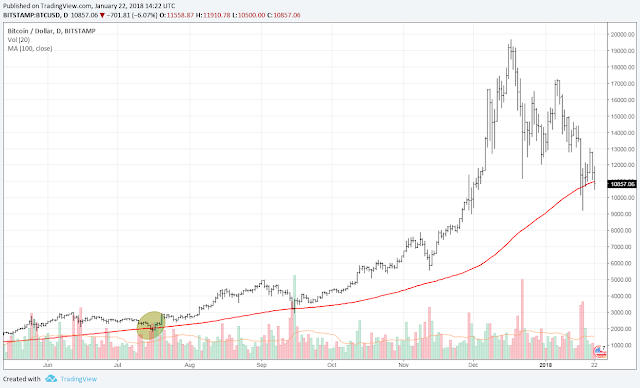 Is Bitcoin a rational bubble phenomenon? One explanation for the appreciation in the Bitcoin price is that people are betting on Bitcoin's future as a means of payment. In the event that Bitcoin becomes widely acceptable as a means of payment, its value will be enormous - there is an upper limit on the supply of Bitcoin after all. Even if I think the probability of that happening is small, the expected value can be high, and if I buy a small quantity I'm bearing a small amount of risk for a huge expected payoff. But, the probability that Bitcoin becomes a serious means of payment looks like zero to me, as the system is fundamentally flawed. Transactions costs are too high, the price is far too volatile, and the system does not permit a large enough volume of transactions. But, in spite of Bitcoin's price volatility, maybe people will ultimately treat it as a safe asset, like gold. Gold is an asset that people can flee to when the returns on financial assets are highly uncertain, and maybe it bears a premium above its "fundamental" value, because people coordinate on it for that purpose. I'm not sure if anyone has studied that. So, maybe Bitcoin can serve the same function? But precious metals have the virtue of having no competitors - there is only so much of the stuff. Though Bitcoin is ultimately limited in supply, the supply of potential competitors is unlimited, and we're currently seeing a flood of close substitutes for it. So, I've run out of options for Bitcoin's future. It represents a poor payments system, and the ability to replicate it means that it can't survive as a safe store of value like gold. Advice: Don't buy that stuff, its value is going to zero - far short of a hundred years from now, I think. But does that mean this is an irrational bubble? Let's think harder. Not everyone is as certain about Bitcoin's demise as I am, and people are working with incomplete information and limited knowledge of how the world works. As with the Dot-Com "bubble" it takes a while for people to understand the market and to sort out which ventures are going to pay off. That doesn't look like the simple asset valuation models we have, but there it is. Argument 1: Miners currently use approximately only 0.0012% of the energy consumed by the world. Most are forced to use hydroelectric power (zero carbon footprint!) because using cheap renewable energy is a necessity to win in the ultra-competitive mining industry. It's true that .0012% seems like a small number. But this is for a would-be monetary system that hasn't even got off the ground yet. Some people claim that a Bitcoin transaction currently requires 80,000 times more electricity than a Visa transaction. If that high cost is a "necessity" in this system, maybe we can do without it. Argument 2: Even in the future, economic modeling predicts that if Bitcoin's market capitalization reaches $1 trillion, then miners will still not account for more than 0.74% of the energy consumed by the world. If Bitcoin becomes this successful, it would have probably directly or indirectly increased the world's GDP by at least 0.74%, therefore it will be worthwhile to spend 0.74% of the energy on it. Bitcoin's current market capitalization is about $180 billion. My estimate of its current contribution to world GDP: negative. There are plenty of economic activities that burn resources and contribute negatively to GDP - theft, for example. Argument 3: Mining would be a waste if there was another more efficient way to implement a Bitcoin-like currency without proof-of-work. But current research has so far been unable to demonstrate a viable alternative. But we don't have to implement a "Bitcoin-like currency." The relevant alternative is the monetary system we have. Argument 4: Bitcoin is already a net benefit to the economy. Venture capitalists invested more than $1 billion into at least 729 Bitcoin companies which created thousands of jobs. You may disregard the first three arguments, but the bottom line is that spending an estimated 150 megawatt in a system that so far created thousands of jobs is a valuable economic move, not a waste. Bevand either hasn't had economics, or he went to the class where they talked about Keynes, and missed the class on opportunity cost. The fact that people are spending time in activities associated with Bitcoin - designing it, trading it, mining, designing new chips, maintaining dedicated hardware, etc., is in fact a waste of resources. All those people could be doing something more productive with their time, assuming the opportunity cost of their time is not zero. To the extent we can learn something, the time spent is useful. But I think we are done with that. Time to stop. Argument 5: The energy cost per transaction is currently declining thanks to the transaction rate increasing faster than the network's energy consumption. I'm not sure this is true, but even if it were, this isn't the right metric. If the transactions aren't accomplishing anything socially useful, all we're worried about is the total economic cost of this project - electricity, time, hardware, software, buildings - which looks to be a significant waste. Digital currencies could indeed be useful, but current technological constraints do not seem to permit a decentralized currency system using blockchain. It's certainly likely that central banks will get into the business of offering digital means of payment, but my best guess is that those systems will be centralized. "But precious metals have the virtue of having no competitors - there is only so much of the stuff." I'd add to this: gold has other uses that create some level of demand for it - as jewelry, industrial uses, etc. Bitcoin and other cryptocurrencies do not. And while we can't eat US dollars (I suppose one could wear them), legal tender laws create some base level of demand. When I boil down the many arguments I've heard as to why Bitcoin has value, I basically come away with "Bitcoin has value because it's useful as a medium of exchange," but this leads to circular logic as typically an object must initially have value before it is useful as a medium of exchange. The value of Bitcoin seems to me to be based purely on a coordination game - while theoretically this could still lead to full adoption, I suspect not.
" 'If Bitcoin becomes this successful, it would have probably directly or indirectly increased the world's GDP by at least 0.74%.' "
I've heard similar claims before. One VC investor, after (somewhat poorly) explaining the equation of exchange, told me that Bitcoin will increase GDP because of increased transaction velocity. He forgot the "P" in the equation. Yes, exactly. Gold and other precious metals have explicit payoffs, Bitcoin does not. But legal tender laws don't require that you use US dollars in exchange. They just require you to accept US dollars in settlement of a debt. "Fiat money is a bubble, as it has no explicit future payoffs, yet people value it in exchange. There are other types of rational bubbles, for example the currently-observed low real interest rate on government debt can be considered a bubble phenomenon. Government debt is used in exchange, and as collateral in financial markets, so that its price exceeds the present value of its future payoffs - high prices imply low interest rates." So by this logic, the U.S. is not on a fiat money standard, since reserves yield explicit future payoffs in the form of interest payments. And this rate, IOR, exceeds many other rates including the interest rate on very short-term government debt like t-bills. That's tricky. Currency is not a promise to deliver any explicit future payoff. But the central bank does promise that it will convert currency to deposits at the central bank, one for one, and vice versa, for some economic agents. With interest payments, reserve accounts represent promises to pay "money" i.e. units of reserves, convertible into currency, in the future. So, the reserves are like Treasury bills (if there were overnight T-bills) except that there's a promise of convertibility into currency on demand with reserves. As well, there are restrictions on who can hold the reserves, and none on who can hold T-bills. The latter, along with regulatory restrictions, is what gives you IOER in excess of the T bill rate, typically. So Fed-issued reserves are currently not fiat money (i.e. not bubble assets), but eight years ago (pre-IOR) they were fiat money? No, I wouldn't say that. If we could pay interest on currency, I don't think we would say it's not fiat money. "If we could pay interest on currency, I don't think we would say it's not fiat money." Ok, But once it pays competitive interest it wouldn't be a bubble anymore. But it's just interest paid in units of itself. Can still be a bubble. For example, some people hold currency, some don't. Why does it make a difference if I augment the money supply by handing more out to everyone, or just to the people who have it? "But it's just interest paid in units of itself." Let's say that ten $100 notes provide their owner with $30 each year interest, the same as a 1-year $1000 bond that yields 3%. From the perspective of the owner, both instruments do the exact same thing. But you wouldn't call the bond a bubble, would you? Why is the one asset a bubble and the other, which is identical, isn't? Why are interest yielding banknotes given the adjective "fiat", but an equivalent bond isn't "fiat"? Suppose we start with a pure currency economy. The stuff is intrinsically useless, but people use it in exchange, and it's valued. Thus, it's a bubble. Then, imagine that we could pay interest on currency, so if I hold the stuff, the number of units I'm holding gets augmented over time at a particular rate. That doesn't make the underlying stuff any less intrinsically worthless. If it's valued in equilibrium, that's still a bubble. Now, think about an economy where there's currency, reserves, government debt of different maturities, and private debt of different maturities. Units of the currency and reserves are also the unit of account in this economy, and all the payoffs on government and private debt are defined in units of account, for example Treasury bills are promises to pay units of money in the future. So are all the public and private debt instruments also bubbles? Certainly not in the same sense as money is a bubble. If money were valueless, firms could still produce stuff, and the government can still collect taxes, so firms and the government can issue debt which represents promises to pay something other than money in the future, and they can fulfill those promises even if money is not valued. Of course the economy in which money is not valued looks a lot different from the economy in which it is. Of course, you could turn this around and argue that central bank liabilities are typically backed by government debt, which is in turn backed by the government's ability to tax, so the central-bank-issued money we know and love is not in fact fiat money. "Of course, you could turn this around and argue that central bank liabilities are typically backed by government debt, which is in turn backed by the government's ability to tax, so the central-bank-issued money we know and love is not in fact fiat money." Right, but I thought we were arguing using the definition that fiat money is a bubble because it offers no explicit future payoff (which I took to mean it pays a sub-market interest rate or zero interest rate). Let's agree that government money and government t-bills are both tax-backed. So in some sense money is not fiat because--like it does with a t-bill--the government can use tax income to support its value. But if the latter pays 0% and the former 3%, then government money still has some bubble component to it, because of the interest rate differential. It's not fiat, but its a bubble? How would you define the bubble component then? What's the fundamental value of money that represents the tax backing? Well, take the Bank of Canada's settlement balances, for instance. The fundamental components are exactly the same on both a 1-day t-bill and an equivalent amount of settlement balances. Both are ultimately backed by the Government of Canada's tax revenues. Settlement balances pay 1%, less than the 1.25% on 1-day t-bills. So the bubble component is measured by the extra 0.25% wedge that settlement balances do not have to provide market participants. The bubble is generated by the fact that settlement balances are uniquely useful for making clearinghouse payments and are kept scarce by the BoC. But only the 0.25% wedge is a bubble, the remainder is all fundamental value. It gets harder to transfer this concept to banknotes, or when settlement balances yield 0%. By design, overnight deposit balances are essentially zero. In some sense deposit accounts at the Bank of Canada are scarce, but that's because the Bank sets the deposit rate 0.25% below the target rate, and then intervenes during the day to guarantee that reserve balances go to zero (or nearly there). So, in a channel regime, there's not issue of having to back the deposit liabilities with anything - they're essentially zero. But, suppose that the Bank of Canada's balance sheet looked like the Fed's now. Then, there could be circumstances in which the short term interest rate was so high that the Bank could not make a positive transfer to the government. In that case, the government could make a transfer to the Bank, or the Bank could finance the interest payments on reserves by issuing more reserves, so it makes a difference how the liabilities of the central bank are backed. An excellent explanation Steve, thank you! Here are some thoughts. I believe the appeal of Bitcoins is that they allow people to engage in illegal on-line transactions without fear that these transactions are recorded, as they would be if these people had used a centralized electronic mean of payment (though even Bitcoins are not, in fact, completely untraceable by law authorities). Because of this usefulness, and unless we legalize all transactions, Bitcoins should always have some positive value since they serve a function that other means of payments cannot. And, as more people learn how to use them and demand increases, there is a chance that the price will rise further. On the other hand, you are correct that the supply of substitutes is elastic, hence the demand specifically for Bitcoins may not rise even if demand for decentralized digital currency does. And of course, all this implies that its contribution to economic surplus may be negative. In any case, I think that Bitcoins will command a positive price in the future determined by the marginal cost of creating more Bitcoins or other forms of decentralized digital currency, but will continue to serve mainly a niche market. Yes, I didn't touch on nefarious activities, which is a good part of the motivation to use Bitcoin. People can also use central-bank-issued currency for illegal transactions, but digital currencies have some obvious advantages - it's hard to move currency over long distances and across borders, and it takes up space in large quantities. As you say, this just adds to the resource costs. Allowing people to issue the stuff will promote crime. Then, for example, if the government eliminates large-denomination currency, that should increase the demand for cryptocurrencies. We are still left with a bit of circular logic (though again, this is true to a certain extent with fiat currencies): people are willing to accept Bitcoin in exchange for illegal goods because Bitcoin is perceived to have value, but it has value because it is accepted in exchange for illegal goods. That said, clearly people have coordinated on using Bitcoin. However, it leads me to believe that Bitcoin's value will continue to be highly volatile, because nothing else really pins down demand, supply at any given point in time is fixed, and future supply is fairly well known. It would be nice to know how much Bitcoin is being used for illegal transactions. Though we can see Bitcoin transactions in the blockchain, we can't see what's on the other side of the transactions - which of course is why this is attractive for illegal activities. Yes, I agree that, in any case, the price of Bitcoin will be volatile. That makes it a poor medium of exchange both for people making legitimate transactions, and for criminals. "Though Bitcoin is ultimately limited in supply, the supply of potential competitors is unlimited, and we're currently seeing a flood of close substitutes for it." I think Bitcoins history is a distinguishing feature from other cryptocurrencies. If you had to predict which will hold better value, Bitcoin or a cryptocurrency I just created, the choice is obvious. It's a pure coordination game, but there can be a wandering path toward coordinating on Bitcoin as a store of value. The longer it avoids some huge fall in value, say 95%, the better case it has a store of value. According to this website at least, gold had a inflation-adjusted 83% fall in real value. If Bitcoin holds its value for another 7 years (since it was worth more than $1), will you revise your prediction? How about 30? I think it's entirely possible the people calling it are a bubble are right and it will go to zero. I just wish they would tell us how much longer it will have to last before they will change their mind. Hi Steve, I wonder if you saw this article on Bloomberg by Tyler Cowen. It talks a bit about Bitcoins but, more importantly, Tyler is asserting that the high prices of US stocks, bonds and Bitcoins indicates a shortage of safe/liquid assets, and hence price drops may signal a return to normalcy. I hope he is not getting credit for the theory. You have been formulating and selling it for a while now. I'll have a look at what he wrote. It's not like I'm the only person who thinks about safe asset shortages, or writes about them. Caballero has work on this, and Caballero and Farhi. I wouldn't use it to explain high stock prices though, as stocks are not safe assets. The shortage comes from the use of safe assets as collateral, and to satisfy regulatory constraints. For example, a bank can't use stocks to make sure it meets the required liquidity coverage ratio. The stock of safe assets consists primarily of government debt. I think he argues that blue chip US stocks are safer relative to assets in the rest of the world. Fair point about you not being the only one, but I don't think Tyler, who I like otherwise, has any academic work on this. I know it's a Bloomberg OpEd but I still think he should have cited some relevant academic work rather than present it as a novel idea. What we refer to as "cash" today is not what our forefathers referred to when they said "cash". In an earlier time, the term "cash" meant specie, i.e., coin, usually minted by the state or by sovereign's mint, in gold, silver, copper, or bronze. Paper money, was referred to as "notes", originally, and was convertible into bullion or species at a fixed rate of exchange. In the US, notes were issued for convenience initially, taking the place of bills of exchange and cheques. The evolution of 'money' through time mirrors the development of social systems, and as such we should expect continuation of that evolution going forward. Crypto-currencies should be viewed in that light. Imperfect though they are at present, and subject to speculative impulses that roil that market segment and are little different from earlier experiments (e.g., Dutch tulips), in time they will mature and find a central roll in conventional exchange transactions more broadly. Central banks may not welcome it, because they lack control over issuance and valuation. But they didn't like bills of exchange either when the market for bills supplanted the market for specie diminishing the economic rent earned by the sovereign through his minting operations. In time crypto-currencies will be tamed by the central banks own issue of the same. Give it a few years. "mirrors the development of social systems" That's pretty vague. More accurately, it reflects technological change. Cryptocurrency is here because of developments in computer science, in part. "Central banks may not welcome it, because they lack control over issuance and valuation." Central banks don't have a lot of control over all kinds of conventional private provision of liquidity. I know that some cryptocurrency fanatics are paranoid about central banks controlling stuff, but I don't see a lot of concern among central bankers with cryptoccurrencies causing loss of central bank "control." The central bankers are wondering whether there is anything in the technology they can use. The answer may be no. Right now, my best guess is that working cryptocurrency systems are just too costly. Bitcoin is a great technology and this should be used in some productive way.